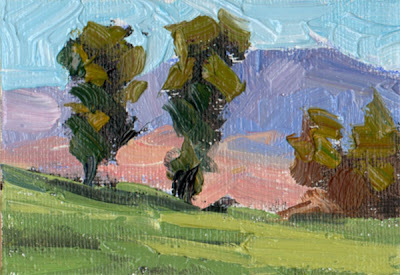 3.5”X2.5” Original oil, ready to frame. 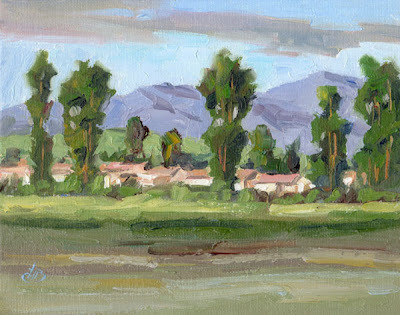 I created this miniature painting to explore the color and composition of this scene before deciding whether to paint it as a larger canvas. Once I had completed it, I realized this little gem perfectly expressed everything I had to say. It may be small but it packs a lot of emotion! 8X10” Original oil, ready to frame. The historic Mission in San Juan Capistrano is located in Southern California between Los Angeles and San Diego. It is the home of the Swallows of Capistrano, who have returned to the Mission each year for centuries to nest and have their young. Known as "The Jewel of the Missions," it was founded by Junipero Serra in 1776, and is the seventh of the 21 historic Spanish Missions. 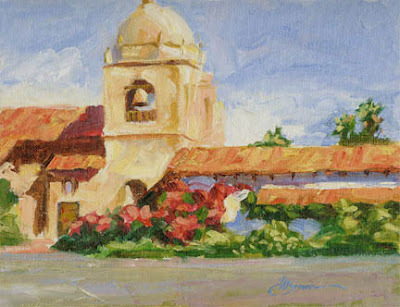 This painting shows the famous bell tower of the mission. 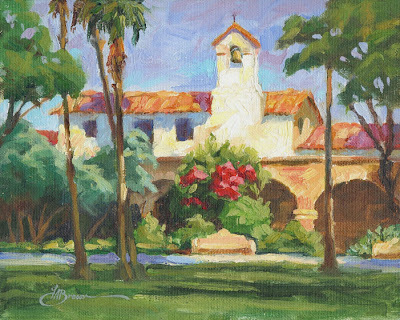 Colorful bougainvillea and palm trees set off the graceful arches and stucco walls of the mission. This painting is available on eBay. Click the headline to bid. 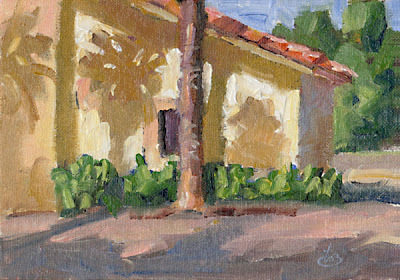 I happened upon this charming adobe at just the right time of day, when shadows from graceful palm trees were cast upon the stucco walls and red tile roof. I never miss an opportunity like this and promptly opened my paint box to capture this on canvas. 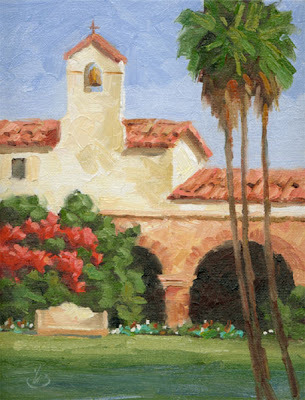 This painting will bring a sense of Southwestern color and light into any room of your home. I was raised in the Midwest and after living in California for many years I am still in awe of the breathtaking scenery on the coast; the palm trees swaying in the fresh ocean breeze, the surf lapping at the beach. To me it is truly a paradise. I immediately set up my easel and set to work to record this moment on canvas. Surprisingly, she didn’t move the entire time I painted this picture and was still glued to the laptop screen when I packed my paints and left with this painting. Hope you like this one. If you just can’t live without it, email me and we can make it yours. My wife cut these roses from our yard and I grabbed the opportunity to turn them into this colorful still life while I had the chance. I took this arrangement back outside and painted it under the warm California sun. This is one of those paintings that will bring a feeling of summer sunshine and fresh air into your home every day of the year. Please leave a comment below if you enjoy this blog. Visitor’s comments always brighten my day. Thanks for looking and come back again. 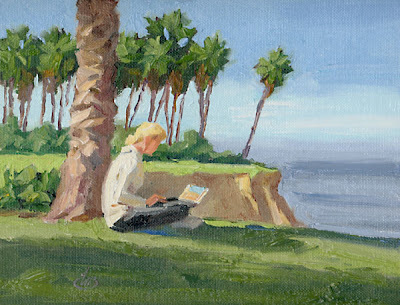 The painting shown at the top of today’s blog is an 18” canvas that was painted on location during my usual Saturday plein air workshop. I was attracted by the sprawling limbs of this ancient Sycamore tree and the dappled light filtering through the branches. 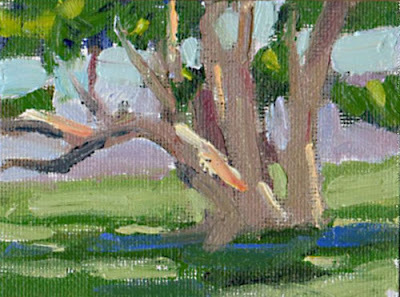 Shown beneath this painting are two 4”x3” studies that were done to explore possibilities before tackling a larger canvas. 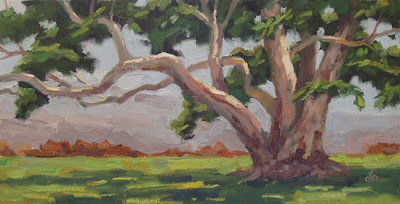 The first study was painted in early morning as the sun illuminated the limbs of the Sycamore, and the second was done at noon when the sun was directly overhead, as shown in the large painting. 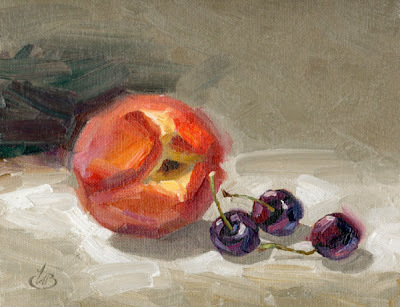 I began this week’s workshop by having all the artists create a series of small studies like these. This exercise helped loosen everyone up and get the creative juices flowing. 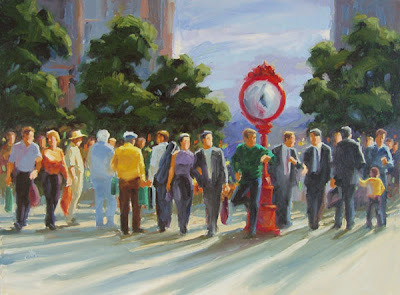 It also helped each artist clarify the essential elements of a composition without getting caught up in fussy details. By the time everyone had done a few of these quickies, they were warmed up and ready to tackle a larger canvas with authority. 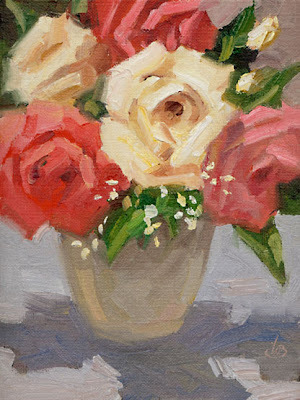 The surprise is that these little gems often make very frame-worthy paintings in their own right! If you haven't checked my blog lately take a look at my Tuesday and Wednesday entries. 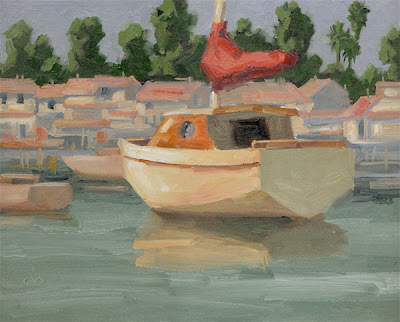 I posted a couple of step-by-step demonstrations showing my plein air paintings being created on site. And if you enjoy my blog, leave a comment below; it will make my day. These new homes in Southern California have a spectacular view surrounded by towering trees, rolling green hills and majestic mountains. This gives the impression of being a remote location but fortunately for me it’s not far from a Starbucks. I need my coffee to stay motivated! I accept PayPal, Money Orders or personal checks. I ship to US only. To see my paintings that are offered on eBay click the headline above this photo. Thanks for looking and have a wonderful day. Oh, and if you enjoyed the view or the daily thought to smile about (below) please post a comment on my blog. It will make my day. 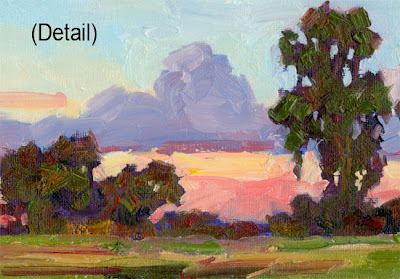 Today I invite you once again to “look over my shoulder” as I create another painting on location. I discovered this antique truck parked beside a country road. It was late afternoon and I was struck by the golden sunlight washing across the scene. I began by drawing with the brush to block in the big shapes, paying a bit more attention to accurate drawing of the vehicle. I also made sure to locate the long shadows on the road, since these would change soon. Then I stated the darkest darks of the trees and foliage before laying in the broad shapes of sunlight in the trees. 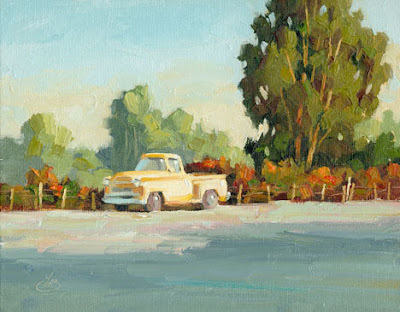 With this done I moved to captured the elusive color and light in the sky, which was very fleeting, then I added the wood fence along the roadside. Finally I took the time to carefully paint the truck itself, making sure to get the details accurate (see the detail photo), and last I completed the roadway with its long shadows. 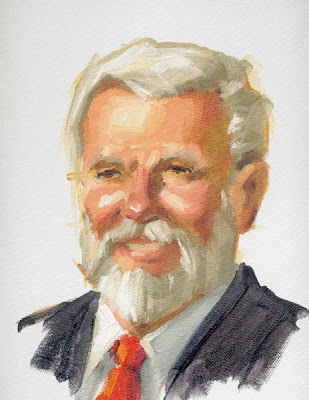 I enjoyed painting this one and hope you liked “watching me work.” If you enjoyed this step-by-step demo please post a comment here on my blog. It will make my day. 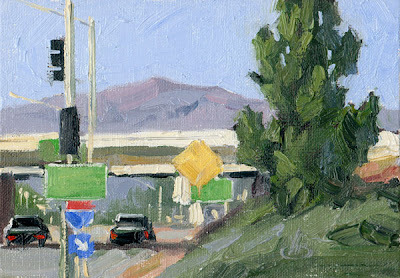 Today I invite you to “look over my shoulder” as I create a plein air painting at the edge of a busy roadway in southern California. I was attracted to this scene by the apparent contradiction between man-made objects and the organic shapes of nature. I started with a few dark marks to indicate placement of key shapes, then immediately began using spots of color to create important elements like road signs. I continued to establish form with strokes of color that became mountains, a towering pine tree, a roadway, and additional signs. Traffic signals emerged, the sky was established and the freeway bridge was refined as the painting evolved and neared completion. Final details such as light poles, tail lights on the cars and additional road signs brought the painting to finish. Compare the painting with the photo of the scene that was shot when I completed the painting. I accept PayPal, Money Orders or personal checks. I ship to US only. 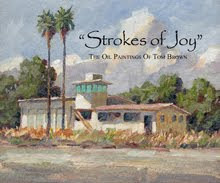 To see my paintings that are offered on eBay click the headline above this photo. Thanks for looking and have a wonderful day. Oh, and if you enjoyed this step-by-step demo please post a comment on my blog. It will make my day. HAPPY FATHER'S DAY! This is a large panoramic painting of a stunning sunset, loaded with pure emotion. The canvas measures 18 inches wide and it has lots of thick, juicy strokes of oil paint and bold color. I have included a detail photo as well as the complete painting; click the pictures to see larger images. It was one of those rare sunsets when everything was absolutely perfect, and I was in the right place at the right time. The picture almost painted itself. I just grabbed the brush and hung on for the ride. Hope you like it. Thanks for looking and have a wonderful day. This large urban scene is filled with interesting detail to explore. A man leans against the antique town clock checking his wristwatch. Couples stroll past carrying shopping bags, holding hands or immersed in conversation. 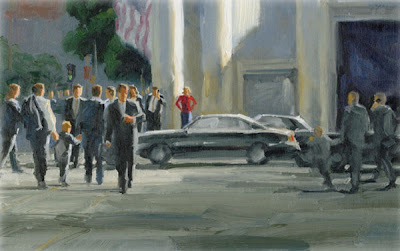 Businessmen with briefcases are involved in animated discussion. A young boy holds hands with his father. A senior couple walks with a younger man (possibly their son) who is carrying his jacket over his shoulder, while another figure pauses to observe something beyond our sight. Sunlight caresses their shoulders and creates long graceful shadows across the foreground. Click the picture to see a larger image. 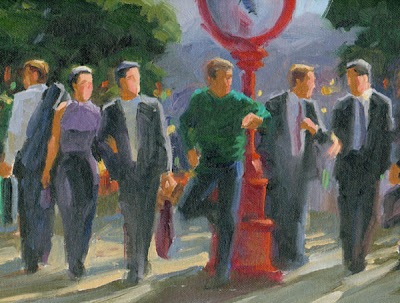 I have included a detail photo of a few figures as well as the complete painting. This is a large painting, 24x18 inches and it is loaded with interesting details and hidden stories. It will grow on you, as you discover new details in it day after day. Click the picture to see a larger image. 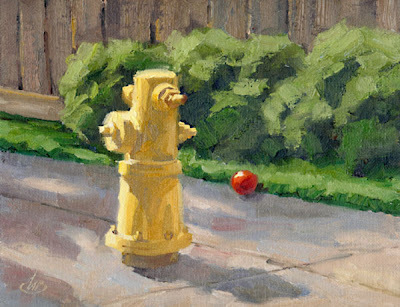 I found it amusing to see this red water balloon on the sidewalk near the fire hydrant. I was also attracted by the lighting on this intimate little scene and felt it made an interesting composition with a story suggested by the elements in the painting. 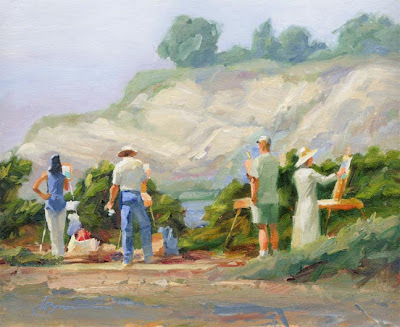 I nearly named this painting “Plein Air Painting of Plein Air Painters Painting en Plein Air.” This is a painting I did on location at the finish of a workshop, showing a few of my students painting at Newport Back Bay wildlife preserve. Foggy atmosphere veiled the cliffs across the bay and created a nice mood. We had a wonderful time, painted some beautiful pictures and formed great friendships. The artist on the far right is a newspaper columnist; the man next to her is her husband. The man second from left is a successful commercial artist and the woman on the far left is a first-time artist. We always have an interesting mix of people in my workshops and I enjoy meeting and getting to know each of them. Marissa is a charming and delightful actress who posed for this portrait during a workshop I conducted. 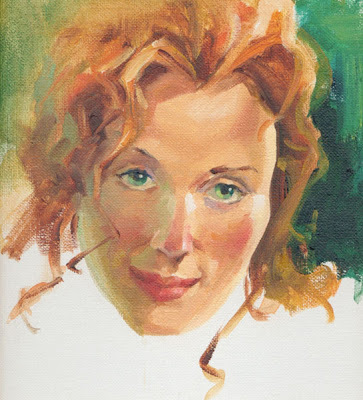 She has flaming red hair, emerald green eyes and a flawless complexion. Click the picture to see a larger image. While enjoying a cup of coffee on my back patio early yesterday morning I found myself absent-mindedly sketching this small birdhouse in our Jacaranda tree. 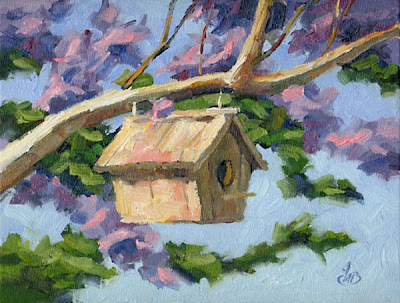 It suddenly dawned on me that this would make a charming oil painting, with the periwinkle flowers of the tree surrounding the homemade birdhouse. 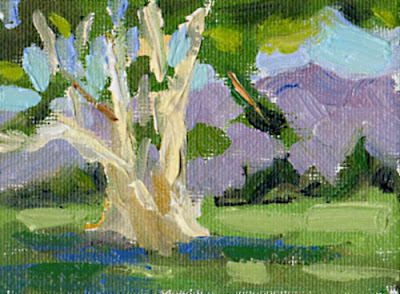 I popped inside, grabbed my paintbox and quickly set up my easel in the comfort of my own yard to paint this little beauty. As I worked I noticed bees feeding on the purple blanket of fallen flowers beneath the tree and robins digging for worms at the edge of our flowerbed. What a peaceful moment! Just as I finished the painting a flower fell from the tree and landed on the roof of the birdhouse. I added that final touch and the painting was complete. 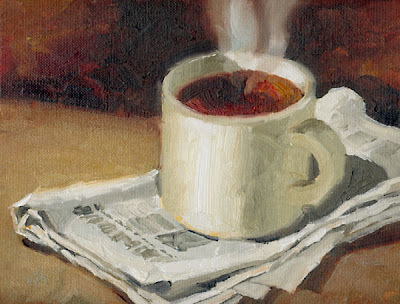 I enjoyed painting the folded newspaper in this piece, especially the headlines and photo on the front page. I also had fun painting the effects of transparent steam rising from the rich black coffee. Click the picture to see a larger image. This dramatic sunset painting will bring a breath of fresh air and sunshine into any room of your home. 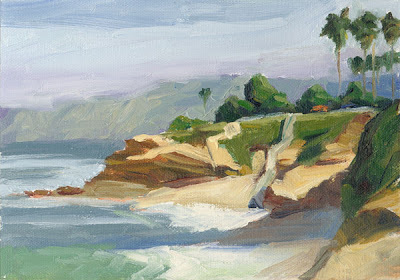 It shows the famous landmark cliffs in Laguna Beach, an artist's colony in Southern California. 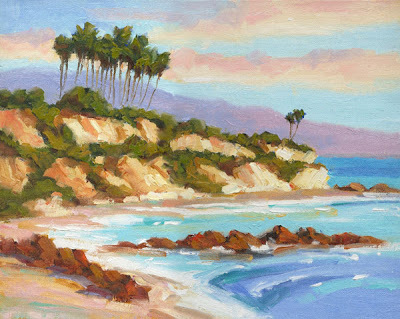 Atop the cliffs are palm trees swaying in the fresh breeze as golden sunlight washes across the scene. Click the picture to see a larger image. 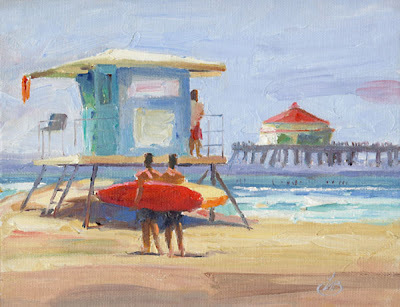 Huntington Beach is officially known as “Surf City.” This canvas was painted on that famous stretch of sand during the Huntington Beach plein air painting invitational competition in which I participated. In the distance is the famous pier with Ruby’s Diner at the end. My wife’s cousin from the Midwest paid a visit to us in sunny California and we drove down to LaJolla to show her the sights. While they did recreational shopping in town I walked down to the ocean and painted this little jewel before joining them for lunch. We all had a good morning! This painting was done as pure self-indulgence. 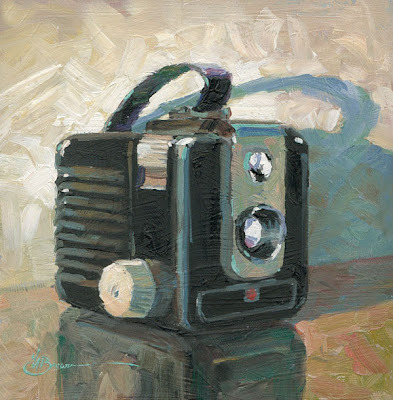 It shows the first camera I ever owned: an antique Brownie Hawkeye. I got it new in the ‘50s and shot thousands of rolls of film with this little beauty. Loved it! I still own the camera, and did this painting of it just for fun.